Our one School rule: ‘Take care that everyone is safe, happy and learning’ embraces the respectful attitudes that underpin the ethos at Carey Donvale. It is a peaceful and beautiful bushland setting, enhanced by many large artworks and installations produced communally by students, staff, parents and friends of the School. These artworks are evidence of one of the remarkable characteristics of Carey Donvale: its sense of community. Small class sizes and activities shared across age levels contribute further to what has become a defining characteristic of the School. The commitment to the local community extends well beyond the School’s boundaries. The City of Manningham and its residents have benefitted greatly from projects driven by Carey Donvale Art staff to which students from other local schools and community groups have been invited to contribute. The Gold Rush History Pathway and tiled fountains in the Federation Playspace at Warrandyte are examples, as is the Pinorchen sculpture at The Pines Shopping Centre, and the fabulous Wombat Bend Playground in Templestowe, together with The Austin Hospital Paediatric Emergency Room mural. At Carey Donvale we do more than admire our beautiful surroundings. We care for them and learn from them and in return they provide us with an ever-changing landscape and native animals to observe and enjoy. The Year 4 students’ Environmental Program allows them to lead the rest of the School in managing worm farms, propagation, recycling and composting systems. These students also lead the entire Carey Donvale community in planting trees and shrubs inside and outside the School grounds. The School community takes great pride in having been awarded a 5 Star Sustainable School accreditation for their work in minimising the School’s impact on the environment in a number of areas. Recognition as an official Resource Smart School is not too far away. The linear park along Mullum Mullum Creek provides a unique opportunity for studying the landscape and all that lives in it, and staff shepherding groups of children clad in gumboots and gloves can often be seen examining the wetlands, collecting samples and recording their findings. Familiarity with the latest educational and research technology is an important component of all studies. 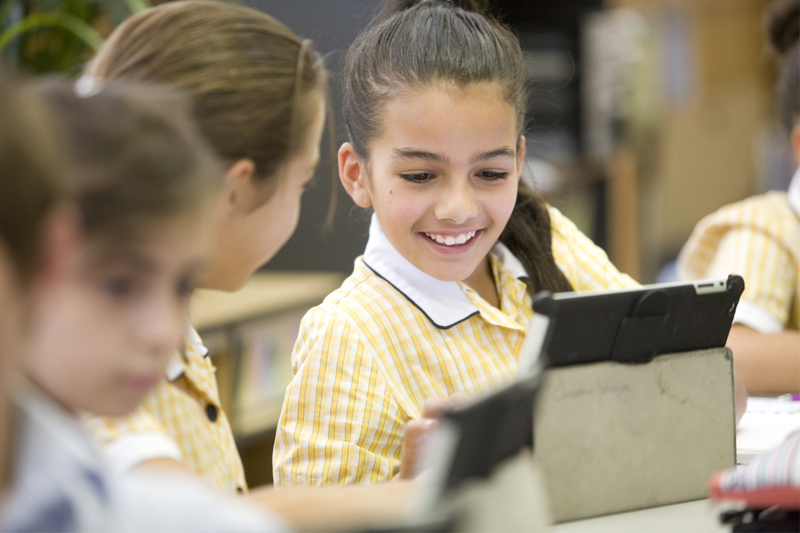 Regarded as a leading school in eLearning, iPads are seamlessly blended into the learning environment from Prep onwards and the software is continually upgraded. Contact with schools in other countries has led to a reciprocal program of art exchanges and correspondence by students, and visits to and from the partner schools by staff. Carey Donvale also has a very strong focus on mathematics and science studies. The children’s efforts are celebrated with a whole school Mathematics and Science Fair each year. We have been awarded the top school in both the Mathematics Talent Quest and the State Science Talent Search Competition on numerous occasions in recent years. Every two years a major musical production is performed for the community involving all children from ELC to Year 6. These productions are staged in the Memorial Great Hall at the Kew campus and provide all children with an opportunity to demonstrate their talents in singing, dancing and acting. A Carey Donvale musical is truly an event not to be missed with over 250 children taking the stage to perform and showcase their talents in the performing arts arena. Carey Donvale parents feel the benefits of the School’s community spirit, and are welcome to become involved with the many groups that support activities from visits to the classroom to help with reading, in to the Early Learning Centre, with the Perceptual Motor Program, or to help staff taking groups on excursions outside the School. A Carey Donvale Junior School Council operates within the School with each class represented by one elected student. The Council meets fortnightly and allows students to have input into what happens in their school. The Council is chaired by the School Captains with support from a staff member. Having participated in Leadership Conferences throughout the year with their Year 6 Junior School Kew colleagues, Carey Donvale students are ready to make the transition to the Kew campus for Year 7. With a carefully planned transition program in place, alongside their Kew colleagues they are well prepared for the Middle School and membership of a more extensive School community at Kew.